The general check-in area was very busy and I would call it 'disorderly'. There was long lines of people queuing at the economy lines and the business lines had quite a few waiting as well. Eventually we were served by a woman who took approximately 15 minutes to process the check-in which I found unacceptable. It seems it had something to do with the optiontown.com upgrade but eventually the boarding passes were handed over. I asked where the lounge was but I was informed I had no access privileges due to only being a standby upgrade. I was pretty taken aback to be honest, at no time during the signup for the business class upgrade was I told I would not get all the privileges that go along with it. I was told I had only paid for service 'in the air'. There was no point arguing so I proceeded through security to the small domestic departures area. I do not recommend arriving too early for your domestic flight at Hanoi as the food and beverage options airside are very limited and there is nothing to do basically. I bought a beer and sat and waited, still a little angry that I wasn't allowed into the lounge. Unfortunately my skyteam elite status through KLM/Air France has long since expired. Eventually boarding was called and I was pleased we would be using the jetway and didn't need to take a bus. There was a priority queue for boarding which I used and by doing so managed to avoid the rather lengthy economy class line. A couple of minutes later I was on board and sitting in seat 5A and my partner next to me in 5C. As you can see above the Vietnam Airlines Boeing 777 features angled lie flats in a 2x3x2 configuration much like the Thai Boeing 777-300. The seats are quite similar to Thai's actually. This aircraft is the flagship of the VN fleet and operated long haul flights to Europe and a few domestic and regional hops in between. For a 2 hour domestic flight it is more than adequate! There is AVOD in every seat but the selection was very limited. I would be rather unsatisfied with the offering if I had been flying long haul. This is something VN need to look at improving. At least the system was fast and responsive as well as being easy to use. Also, the screen is quite large and was crisp, bright and clear. If you were hoping for a view outside and selected or were allocated a window in row 5 then you will be rather disappointed. The only accessible window is way too far forward to see out of whilst seated. For the exterior photos in this report I had to lean forward and stick my camera against the window and just blindly snap away. Boarding was still underway when the welcome drinks and hot towels came around. A selection of orange or apple juice as well as water was available pre-takeoff. Champagne was not an option but that is to be expected I think, when flying domestically. Being late afternoon during the rainy season there was plenty of storm clouds to dodge after takeoff. There was some lovely views which I caught with my camera but couldnt actually see myself! Once up and above the weather the seat belt sign was extinguished and the cabin crew passed through the cabin taking dinner orders, no menu was provided. Both choices were meat and rice dishes. Dinner soon arrived and it came with a side salad and some fruit. A selection of French red and white wines was on offer as well as other drinks. Bread was also available and I took some garlic bread. The meal was decent enough, especially the main course. The bread tasted stale and had no garlic taste at all and in place of the fruit I would have preferred a dessert or cake. I was happy though with the wine selection and my glass was topped up several times and for the remainder of the flight I always had a drink. Service was polite enough but no small talk was entered into at all. Perhaps english chatter wasn't something they felt comfortable with. As the flight continued the sun set and it was soon dark outside so taking photos outside was pointless. I settled back with my tablet to watch my shows and kept the flight information display on my AVOD screen. The landing over Ho Chi Minh was routine and we were soon parked at a remote stand and being bussed to the terminal. Luggage was amongst the first to arrive on the belt so the priority system seemed to work well. Then it was out to the taxi rank which was a confusing and disorderly place and I had no idea what I was doing. Eventually I found one and headed off to the Lotte Legend hotel. 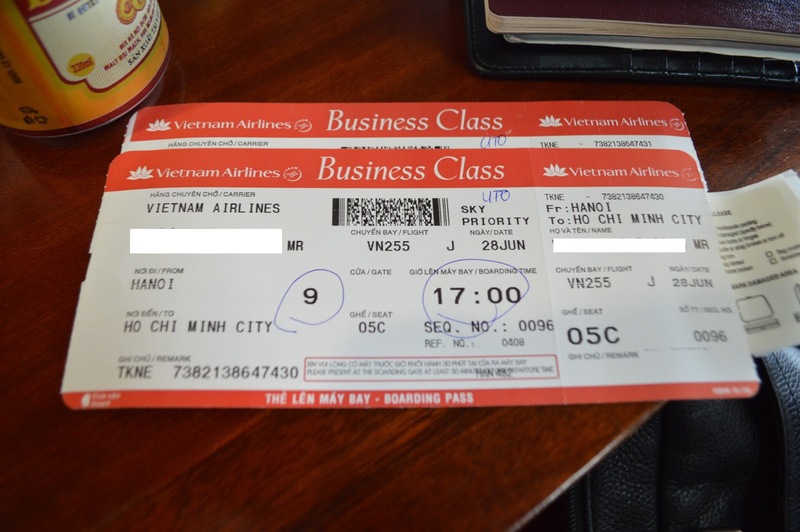 I was quite happy with the flight on Vietnam Airlines, being a domestic flight I didn't have high expectations and wasn't even sure if wine would be served (it isn't on Thai domestic flights for example). The meal was decent and service fine and the seats were excellent. If you happen to be flying the route betweem Vietnam's two largest cities do be sure to choose one of the A330 or Boeing 777 flights if you can, the seats are far better than anything offered on the narrow body fleet. I would consider trying Vietnam Airlines in the future on the direct flight from Melbourne if the chance arose and wouldn't hesitate to recommend them to others who were considering a holiday in Vietnam. For a 3 star airline I find them quite good as well. I have flown them from SYD to SGN in Business and found the service ok, not up there with some carriers but decent enough for the price. Domestically within Vietnam I have only flwon their Business class on the A321 and a320's which the service was ok, but no meals or alcohol! Apparently only alcohol and meals are seved on flights of 2 hours or more meaning only between HAN and SGN! Anyway, Cant wait to read more of your Blog, I love it! thanks matt, interesting about the domestic service on VN, I guess HAN-SGN is the main flagship route so has the best offering. I had a bit of a scary experience in SGN airport in 2007 en route from Melbourne to Manchester via Ho Chi Minh, Hanoi and Paris, which I'm writing about in my blog at the moment. I also found Hanoi to be very 'disorderly' and uncomfortably air-conditioned (too bloody hot!). I think they were in the process of renovations at the time. I was pretty impressed with the airline itself though - AVOD in economy on my 777's would have been nice, but I guess you can't have everything. At the time is was the cheapest passage to Manchester I could get, and the food and service were really quite good. When I was at Hanoi there were "No Cameras Or Photography" signs - were they still there for you or have they realxed a bit now? Thanks for your continued comments. No doubt you might pursue it with optiontown, as I would certainly think it's unacceptable that you wouldn't be afforded lounge access. I've purchased standby upgrades with TG before and not ever received such substandard treatment - lounge access is part of the service and it's sad to hear you were not treated like a deserving client. I won't go into some of the stories I've heard about VN and their staff....! Needless to say they're not all the most upstanding citizens you will have come across. I did notice any signs banning photography. Aussie Flyer nice blog and a great review, I am a regular to Vietnam I have seen but never done the optiontown upgrade as most of my trips are for work in Business Class, but have some personal trips coming up and would be interested to hear if you received Business Class status credits and miles or just the status credits/miles for your originally booked ticket? Just like FreakyFlyer I have done SYD to SGN on Vietnam Airlines Business Class and can't say enough about the service, meal and flights, for the price, really great value.